O-Rings - Highly polished, nickel plated rings (1/4 inch thick) are sewn onto the corners of the banner with reinforced webbing. Loop the rope or cable through the rings for easy tie downs. Rope - Sturdy reinforced cotton rope is sewn into the hem of the banner. The exposed rope at the corner is looped to the backside of the banner and fastened securely with rings going through the banner and rope. Rope is looped at the ends (3 to 6 inches) for tie downs. Sturdy #2 brass grommets are placed every 2 feet along the edges of the banner. Cost is $1 per foot added to banner price. Snap Hooks - Hooks are sewn into the top and bottom edges of the banner with a reinforced webbing. These hooks can be attached over a steel cable or rope. Hooks are only sewn onto the top and bottom edges. 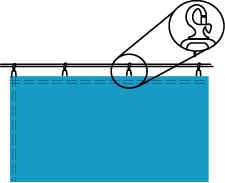 Once secured, hooks provide high wind resistance and are commonly used in over-the-street applications. Cost is $4 per snap hook added to banner price. 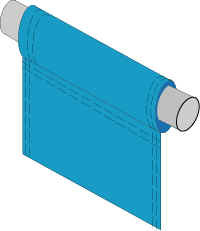 Pole Pockets - Have a variety of uses including hanging banners from ceiling with weighted bottoms. Insert poles into banners for parades, to fit over existing frames, or between upright poles. Any size pocket can be specified. Cost is $2 per foot of banner added to the banner price. Note: Pole pockets reduce the finished width of banner. Pocket for 1" pole reduces banner size by 5 inches, pocket for 2 1/2 inch pole reduces banner size by 10 inches (assuming top and bottom pole pockets). In addition, text is not placed over pocket further reducing the area available for text/ graphics. As a general guide, order a one size larger banner to allow for pole pockets. For example, order 46 inch x 4ft banner for a finished pole pocket banner size of 34 inches x 4 ft.
We'll provide you with a price within the half-hour.